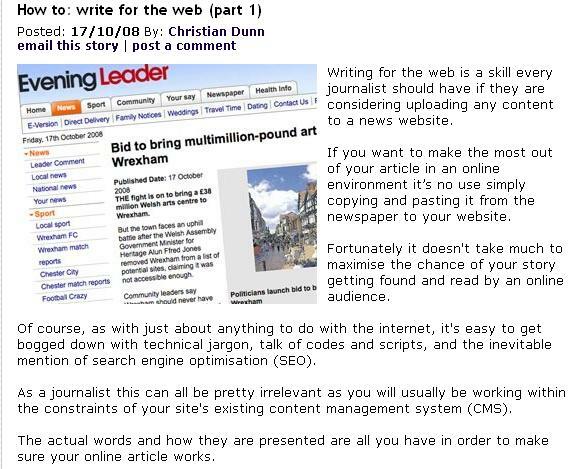 Christian Dunn, digital editor for NWN Media Ltd, publishers of the Evening Leader (UK), has published in the Journalism.co.uk website the second part of “How to: write for the Web“. This second part deals on how to write a good headline and (not) to ruin all in the first paragraph; how to make the article as “scannable” as possible, since Eyetrack experiments shows that most readers scan the text in a F pattern; how to use links; and how to end calling to action. First part of this work dealt on how to facilitate people find the article, avoid the use of spamglish, keywords, and how to give the reader something he or she could not find in print.